When I woke up I lay still and looked at Emil. It made me happy to see him—his face still had the same lines, the same strong jaw. I realized I was crying; Emil woke up to a mild, but salty, summer rain. I said I was sorry. We stayed in bed for a while. My cyst made its presence known; something secretive and painful behind my belly button. It hurt: a straightforward, simple pain. I tried to ignore it. We went biking. There was a river snaking through a forest. At the Netto supermarket in Dalum I came across a frozen one-person meal titled Brændende kærlighed. Burning love. A red box with a photo of an indistinct meal printed on the front. I held it for a few seconds, flooded with something, perhaps the gravity of the universe. There I was, in a supermarket in a part of the world that just a few months ago had been without any significance to me, in my hand a pre-packaged meal titled in a language I had only just begun to understand. It was a magnificent moment, brilliant. I showed Emil the box and we both held it in our hands. Our eyes had tears in them, maybe mine more than his, and the kiss sealed by the Brændende kærlighed confirmed that we were friends again. Emil promised me he would soon serve me a vegetarian version of the meal (which was really just mashed potatoes with pieces of bacon). The adjacent freezer box held packages of forloren hare. Mock hare: a piece of ground beef rolled in bacon. No apples. For Christmas. I realized I had done something wrong. It was a large, fundamental error. Translated from the Swedish by Kira Josefsson. “Mock Hare” is an excerpt from the novel Nora or Burn Olso, Burn by Johanna Frid (Ellerströms, 2018). 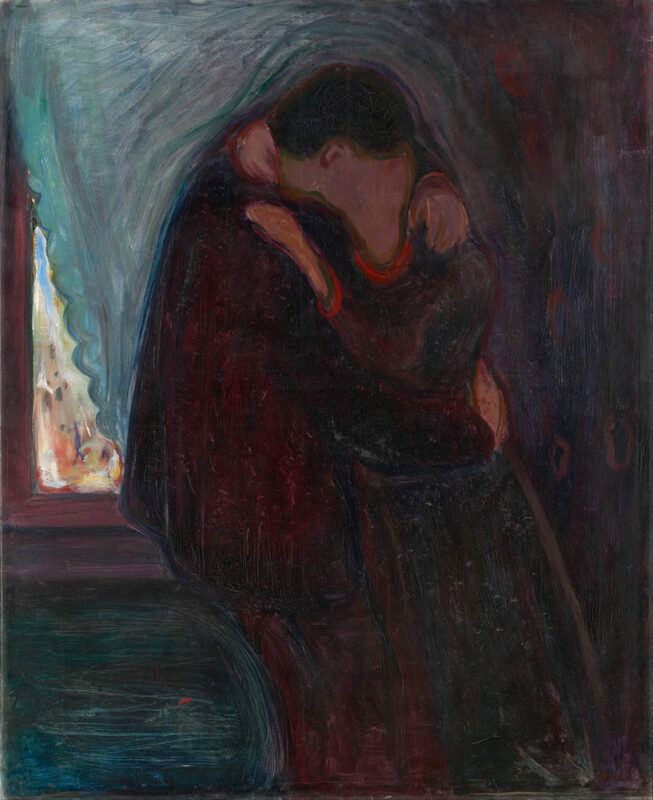 Artwork by Edvard Munch, Kyss (1897). *AFV Press has put out such Tyrant-contributing succulence as Logue, a journal of art and literature edited by David Fishkind (of which there is another coming soon), and Thank You, a chapbook by Zachary German, which one can download the PDF of here.